Funds raised from the 2015 Staten Island Board of Realtors’ (SIBOR) Challenge Cup golf outing contributed toward the goal of a new pediatric-oncology center on Staten Island. 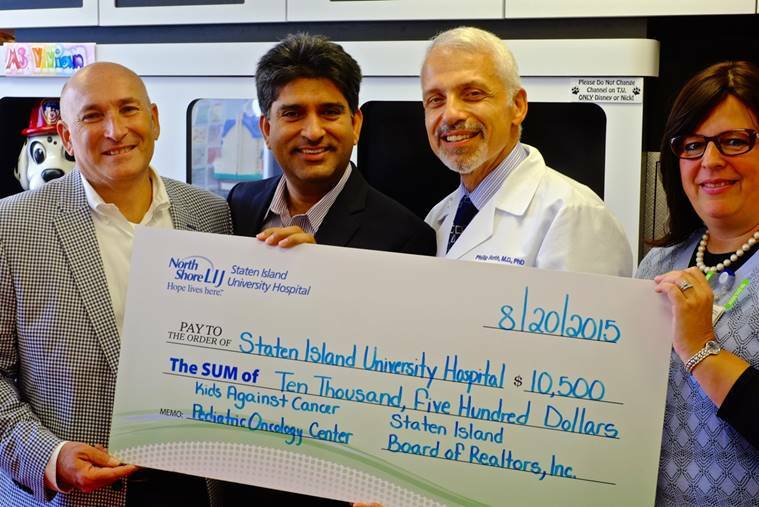 From left, Ron Molcho, a SIBOR director and chairman of the golf outing, and Dil Gillani, 2015 president of SIBOR, presented a check for the Staten Island University Hospital Northwell Health /Kids Against Cancer pediatric-oncology center to Dr. Philip Roth, director of Neonatology and the Department of Pediatrics at SIUH, and Dr. Sarah Vaiselbuh, a pediatric hematology-oncology expert and director of the new wing at the hospital’s North campus. STATEN ISLAND, N.Y. (June 16, 2016) – Members of the Staten Island Board of Realtors (SIBOR) will be staging a Realtors’ Challenge Cup fund-raiser to benefit a new Kids Against Cancer unit at Staten Island University Hospital Northwell Health, Ocean Breeze. The golf outing is scheduled for Wednesday, June 22, at the Grand Oaks Country Club, 200 Huguenot Ave., Huguenot, and is being chaired by Ron Molcho, a SIBOR director. Staten Island University Hospital Northwell Health and Kids Against Cancer (KAC) predict that the planned suite will double the hospital’s capacity for outpatient chemotherapy treatments as alternatives to hospitalization. Children with cancer and blood-related disorders will have a child-friendly environment containing features like a one-wall fish tank, running waterfall with a teen’s corner, interactive video games, an IT wall with touch screens, and an exposition of fluttering butterflies. Additional information concerning sponsorship opportunities or event registration is available by contacting Annmarie Izzo by phone at 718-928-3223 or via email at annmarie@sibor.com. The Kids Against Cancer Pediatric Oncology Center will be located on the second floor of the hospital’s Nalitt Building, 256C Mason Ave.